I’m a mom. It’s my right to brag on my kids, loudly and often, especially when my kid does awesome things and makes me proud. But even if Adam Quinn (aka Dark Omen) wasn’t my kid, he’d still be that 13-year-old teen that I’d love to hang out with because he’s just so darn interesting and funny. 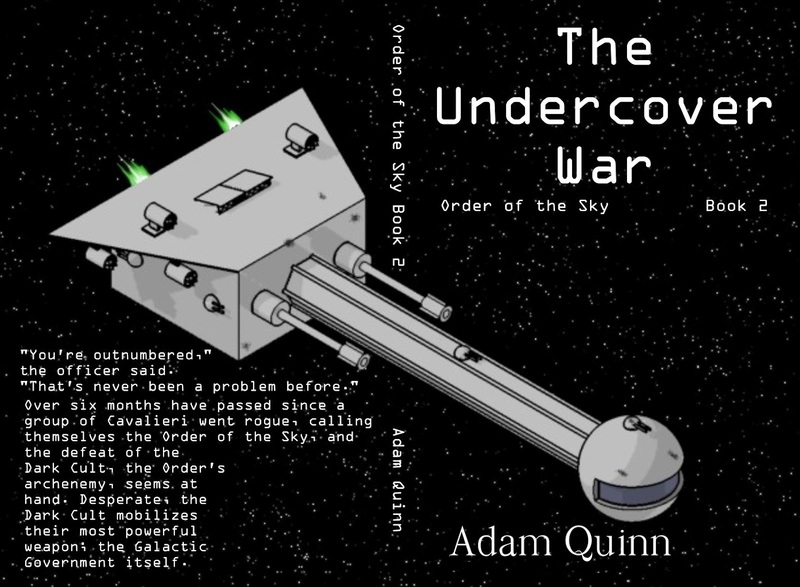 Adam’s latest accomplishment is the publication of his second middle grade novel, Undercover War, the sequel to his first one, Adventures at and Around the Galaxy, published last summer. All the details of how those books were published can be found in yesterday’s post Publishing Your Kid’s Work. To celebrate the release of his second novel, I asked Adam to guest post. Remember how your English teacher/critique partner/friendly neighborhood author always told you that the hardest part of a literary work to write was the introduction? Well, the same holds true for blog posts. Luckily, a picture is worth a thousand words, so a picture of my cat looking smug while holding a Wii remote is certainly worth a well-thought-out introduction. However, I’m sure that what you really want is for me to write about being a young indie author. About being a young indie author. Okay, I promise I won’t do that again. The first two are people, who I will talk about in a moment. As for the third – nobody ever told you that when you signed up to be a writer, did they? Even if you could churn out novels at 60 words per minute, it would still take you 1000 minutes, or 16 and 2/3 hours to write a 60,000 word novel. Realistically, you would have to type a lot slower, say 20 words per minute (if you’re fast), to get something decent, bringing us to 50 hours. And that’s just the first draft. Add two or three more, and you’ve got 150-200 hours. That’s six to eight days of typing. Incessantly. Day and night. And don’t even get me started on plotting and character work. Only a hermit could put in that kind of time. A contact is a person who is connected to the literary world in some way other than being an author (they can be an author too, such as my mom, who is an author, but also a blogger). They can provide advice that isn’t directly related to your literary work, support your efforts, and bring back news from their clan’s epic battles against roving bands of trolls and shifty-eyed penguins. A writer/critique partner is almost self-explanatory – this is a person who can give you good and honest critiques, and someone you can return the favor to. In many ways this person is even more important than your contact (in fact, they can be your contact, as mentioned in the example above), because without them, your story is not going to be pretty, no matter how good you think you are. The real issue with these people is finding them. If your candidate critique partner has any published works (traditional or indie), this is easy. Just read one of their books, preferably their latest one, and if it is noticeably better than your own work, boom! You have a potential critique partner! Evaluating people who haven’t published anything, or those whose published work is of comparable caliber to yours is more difficult, which is why I invented the Paper Test, shown below. Write a literary work of the same genre that you will ask your Critique Partner Candidate (henceforth referred to as CPC) to critique, should they pass the test. It should be 1-2 sheets of paper long. This does not have to be high quality work. Do not edit your work. Intentionally add a small mistake to your work, such as a missing word or a punctuation mistake. Do not edit your work! Ask your CPC to read and critique this short story. Remember that this is not your finest work, and it has never been edited, so it should be sloppy. You can preface your request with this information if it helps your ego. As for my latest novel, The Undercover War, the sequel to Adventures at and Around the Galaxy, there’s not much to say. It’s out, it’s free, and here’s a link to my blog, where you can find the links to download it as an e-book or buy it as a paperback. 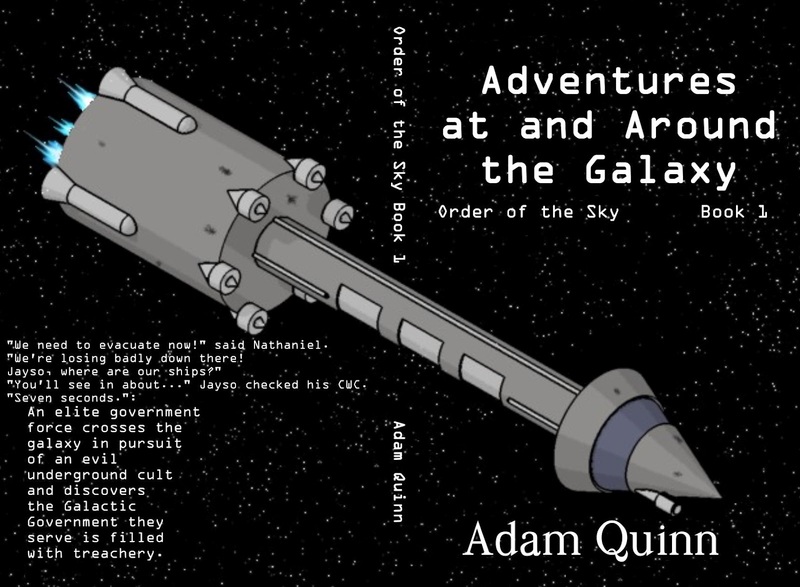 The now six month old Order of the Sky attempts to secure information regarding the location of their archenemy’s last refuge, while contending with the threat of a militarized Galactic Government. Man, you are one cool kid. Great post, Susan. Love the table. I don't test my beta readers, but based on what they catch and don't catch helps me ranking them as to where to place them on my beta waves (i.e. when I give them the ms). The kitty picture was a good enough intro for me. I hope it helps! I designed the paper test to be quick and easy, but you could easily adapt it to your manuscript, if you wanted to. Just make sure you keep track of any "false errors" you put in, to make sure you don't accidentally leave them in. This is very impressive. There are adult authors less motivated and talented than you, Adam. Very inspirational, indeed! I love to see kids succeed. Thank you. I'm just happy that, especially since the dawn of e-books, the infrastructure is in place for kids to succeed. That isn't true of all hobbies/practices. I know all about bad kerning. (I once worked for a software company that made, among other things, desktop publishing software.) AARRGH! I like that nearly all your outcomes include "Thank them for their help" as the first step. Nicely taught, Mom. "You have FAILED the PAPER TEST! Now I will teach you BAD KERNING!" That's so awesome Adam that you're writing and publishing your stories. I'm always amazed when kids can write and blog with the hectic life of school and other interests. Congrats on your second book. Thanks! You can say that again! Adam, I am so proud of you for your success with the first book and now the second!. I can't wait until it is on my Nook so I can read it. Atta Boy!!!! Thank you! I think Mom sent you an e-mail with instructions for downloading it. Okay, that was a damn good post. I'm impressed. Love your table. All of that is only too true! I've never really found a good CPC who is local; had to go on-line. I would add, from my own personal experience, that if your potential CPC introduces herself and mentions that she is psychic, in all seriousness, you can skip the "thank them for their help" part. Thank you! Note that my table only includes thanking people *after* they take the Paper Test. If they introduced themselves as a psychic, I'm pretty sure we wouldn't get to that stage. Then again, maybe she could predict your sales or something.